This week we are profiling Nannye Hasinjara Randriamanantsaina, a primatologist based in Madagascar. Nannye holds a Master I degree in Anthropology and Evolutionary as well as a Master II degree in Primatology from the University of Antananarivo. 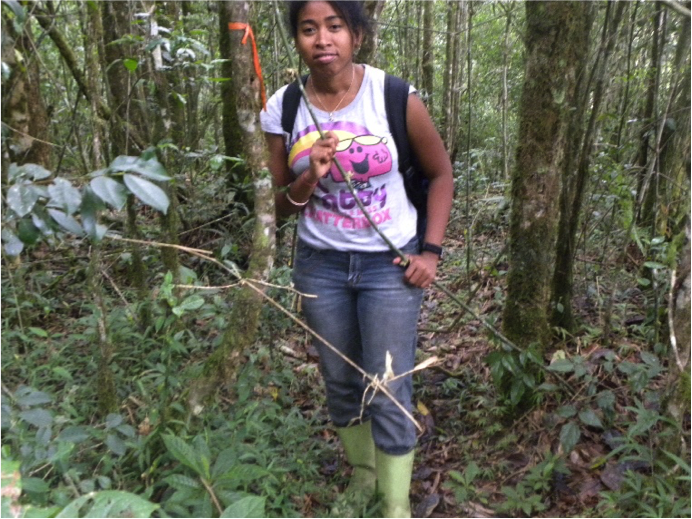 Nannye worked in the past as a professor of primatology and paleontology at the University of Antalaha (Madagascar) and now she works at Madagasikara Voakajy where she manages the survey of lemur populations in protected areas promoted by the organization. Nannye can be contacted at nannyehasinjara@gmail.com. When did you first get interested in working with lemurs and conservation and what motivated you to undertake this work? 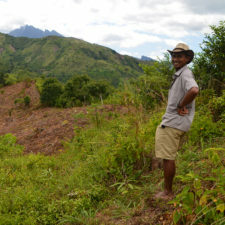 Having grown up in rural Madagascar, I always loved being close to the nature. When I entered University, I opted for the Biology Department, just to keep that link with nature. 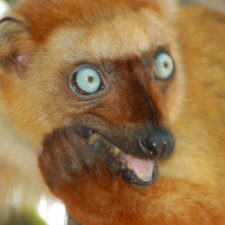 This is also when I learned more about lemurs and became more and more passionate for their conservation. When I was a child, my parents kept nine dwarf lemurs and rabbits as pets. None of us knew that keeping lemurs as pets was illegal; I learned this only when I was at University. At that point, it was too late to save the lemurs we kept in captivity, as they had already escaped from their enclosure years earlier. It was nonetheless the key to my motivation to work as a primatologist and to save Madagascar’s unique lemurs from hunting and habitat loss. What projects are you currently working on that relate to lemur or environmental conservation? Currently, I work with Madagasikara Voakajy as the manager of the lemur surveys that we undertake within the protected areas that our organization promotes. Considering that traditional lemur survey methods are very costly, I am working to adopt the “occupancy modeling method” for the Mangabe protected area. This way, I can train and involve local community members to conduct the surveys and I will collect and analyze the data. This will be an opportunity to not only engage with, but also to provide additional income to, local community members. 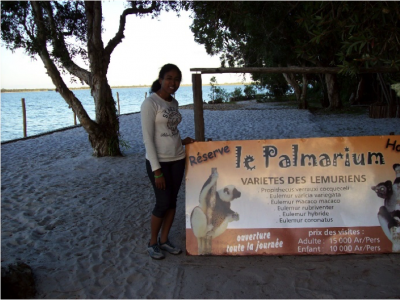 What are the hardest parts about doing lemur-related work in Madagascar? The challenge in doing lemur-related work in Madagascar is the fact that people don’t really know that lemurs are unique to Madagascar. 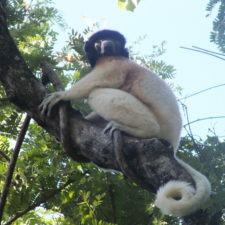 Instead, most people are convinced that lemurs and the forest are a gift that can be exploited. The necessity to respond to the immediate basic needs of communities reduces peoples’ insights into thinking about the future and biodiversity. This is worsened by the lack of education that hampers adoption of new or improved techniques, including tools that could actually improve the livelihoods of local communities. 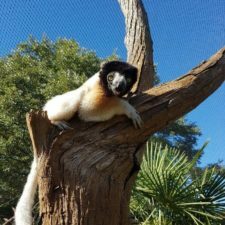 What are the biggest threats facing lemurs in your line of work, and what needs to be done to alleviate those threats? Where I am currently working (Mangabe new protected area, Moramanga district, Alaotra-Mangoro Region), habitat loss caused by slash-and-burn agriculture and illegal gold mining as well as hunting are the main threats facing lemurs. Alleviating those threats requires a need to account for social, economic, and ecological dimensions. Some members of the local communities and authorities are already convinced about the need to conserve lemurs and their habitats. Therefore, a priority is to empower these people and leverage their dedication, thereby inspiring other members of their communities to also support conservation initiatives and to enforce existing wildlife regulations. I also believe in the need to improve education and integrate lemur, as well as wildlife conservation more broadly, into the education curriculum. Finally, researchers should help conserve lemurs by communicating the results of their research, and sharing their passion, with all stakeholders. Do you have an example of the challenges you’ve faced in your work? Back in 2012, I was carrying out a lemur survey in southern Madagascar and also running awareness events with local communities. We hired local guides who stayed with us throughout the fieldwork and learned about the importance of our work. Nonetheless, at one of the villages – after the awareness campaign – we saw lemurs on our way home and our guide started throwing stones on them in an attempt to catch and it eat them. This anecdote illustrates the challenge of changing people’s attitude and behavior. I do always keep this anecdote in mind when designing awareness programs. In ten years, what do you hope to have accomplished in terms of your work in lemur conservation? In ten years, I hope that there is no deforestation, hunting, or gold mining around our protected area. If this is the case, then my goal will be to maintain and increase the number of lemurs in our area and to increase awareness to all villages in the region. I really hope that in ten years, the communities around the Mangabe forest will know the importance of both nature and lemurs. I envision that these topics will be discussed in primary schools and that students will be taught to ask questions about the value of lemurs in their daily life. For example, what is the importance of the present of the forest in our life and how to do to preserve the forest and the animal in the forest? Then, what are the effect of the disturbance of the forest? What are the advantage of the presence of lemurs? How can people across the world help save lemurs and help your work? People all over the world can help save lemurs by spreading the word on the need to conserve them, supporting our work directly through donations, and by visiting our website. In particular, I am seeking support to help improve education infrastructures in and around the Mangabe protected area (which is where I work). I am confident that in the long term, this focus on education will have positive impacts on both peoples’ livelihoods as well as lemur conservation. Nannye recommends supporting Madagasikara Voakajy!